ARBO robust thermoplastic pumps resist aggressive chemicals. The Arbo thermoplastic mechanically sealed centrifugal pumps are available in a choice of polypropylene, polyethylene, PVDF and PTFE so they resist the effects of aggressive chemicals which can cause corrosion problems for metallic pumps. By manufacturing all wetted parts out of solid block without the need for injection moulding eliminates the potential for stress-cracking. Furthermore, the combination of tough, non-metallic materials and stress relieving production methods provides strong chemical and temperature resistance to ensure safe and reliable pumping. As well as offering chemical and corrosion resistance, Arbo pumps can handle solid particles up to 3 mm, ensuring extended pump operation in the event of process upset. Introduced in the UK by pumping specialists Michael Smith Engineers, these pumps are designed to handle flows up to 500 m³ /hr, heads to 90 m and are available in close, or long coupled designs. In close-coupled configuration Arbo pumps can be specified in either horizontal or vertical mounting options. The close coupled design is a more compact choice as the pump shaft is fixed directly to the motor shaft. A separate bearing housing and flexible coupling are not required which means a significant reduction in wearing parts and also eliminates the potential for motor alignment issues. 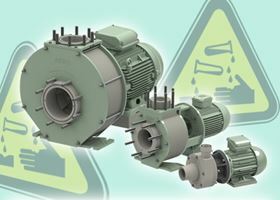 The close-coupled vertical configuration suits in-line positioning and offers the advantage of the suction connection being able to be rotated 90º to the discharge connection to ensure maximum flexibility during system installation. With this option maintenance is simplified as the pipework remains connected and only the housing bolts need to be removed allowing the pump to be lifted using standard lifting lugs. The long-coupled horizontal version incorporates separate frame-mounted bearing support for the motor shaft providing high stability and is designed so that the shaft, complete with bearings, can be removed as a cartridge to simplify the process of changing the bearing. The complete long-coupled pump unit is assembled on a rigid glass fibre reinforced polyester baseplate for superior chemical resistance while the back-pull-out design makes it possible to remove the rotating section without the need to dismantle the piping and so greatly reduces maintenance time. Both the long-coupled and close-coupled designs are dimensioned to ISO 2558 / DIN-EN 22585 and so can be easily interchanged with existing metallic pumps on-site. Typical applications for Arbo thermoplastic mechanically sealed centrifugal pumps include pumping acids in anodising plants, circulating aggressive chemicals in pickling lines, tanker unloading of ferric salts in the water industry, pumping chemicals and untreated effluent in electronics manufacturing, demineralised water circulation in food industry applications, coolant circulation in power plants, sea water circulation in aquaria and any application where metallic pumps will either suffer from corrosion or can cause contamination.